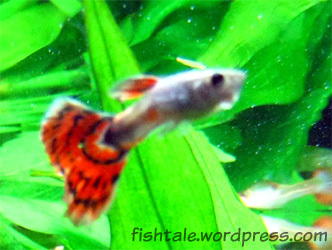 Flowery, a male guppy donning a beautiful red tail, joined our community tank last Friday, when I visited Aquastar in Yishun (see New Carpet Plants Added). 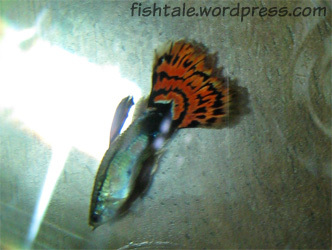 Swimming in a tank full of different types of guppies, he caught my eye due to his bright colourful red colour, and a full tail with no breakage or imperfection. Sold at S$1.00, I netted him up together with another yellow guppy (named him Royalty) from another tank and brought them home. All was well till last night, when we noticed small holes in Flowery’s tail. We were pretty sure these holes weren’t there when we brought him home then. Moreover, he appeared weak and was constantly swimming stationary at the same location. Concerned that he might infect the other fishes with his fungus infection, we quickly moved him to a quarantine tank. Even in the quarantine tank, he did not make much effort of panic by swimming around the tank. Instead, he just simply rested on the floor of the tank and was barely moving. I knew from experience that he would not be able to make it past tonight. Indeed not long after, his dead body was found in the tank. Although our journey with him was very short, we will remember he once existed. I went down to Aquastar at Yishun on Friday evening again (see Located a LFS at Yishun), with plans to buy another two bundles of the S$4.00 plants I bought the other day. After observing the initial plant I bought that day, we noticed healthy and lush green growth, and thus decided it was safe to get a couple more so we can decorate our foreground with these plants. They are not exactly carpet plants, since these unknown stem plants seem to have capability to grow rather tall, thus more suited to be mid-ground plants. Still, they would look good when placed in the foreground provided they are trimmed regularly. Upon getting the two new bundled plants, I simply placed them side by side, leaving a small gap between them, simulating a bushy fence. However, on Saturday morning, I decided to re-organise their location and placed them slightly slanted (i.e. not parallel to the front glass) and just in front of the driftwoods. On the right driftwood, where there is a cave-like structure which the Garras seem to like, I have purposely place two bundle of plants on each side of the cave, thus creating a more attractive appearance. So far the plants appear healthy, and hope they will stay that way. As they grow taller, I have plans to trim them off and re-plant them nearby so it will gradually become a full carpet for the foreground. 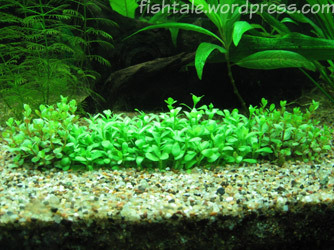 However, we have qualms covering too much of the gravel as the bottom feeders such as Corydoras, Garras, loaches and the SAE enjoy scouting the area and having plants in the region might discourage them from roaming around. Dwarf Chain Loaches Spawning Behaviour? We are supposed to have a total of 7 Dwarf Chain Loaches (Y. sidthimunki) since I bought another 5 (see Arrival of the new Loaches) on top of the existing 2 we had. However, the highest count we could do at one time was only 4, so we couldn’t help but wondering if the missing ones are still alive. This behaviour continued despite interruptions by the other fishes (especially the SAE) so it could be seen how engrossed they were in the activity. According to Loaches Online, not much is yet known about the natural spawning of these loaches, and although some other hobbyists have also witnessed similar behaviour, no one can really confirm if it’s a spawning behaviour. For now, let us just wait to see if any new loaches may pop up someday. 5… 6… 7… 8… what? 8…? Cat and I were having dinner and on a walk in Yishun Central last Saturday when I suggested walking a short distance to a fish shop that I’ve read about on the local forum. We had previously walked around the area but couldn’t locate the shop. It was after I remembered the approximate location on the address posted in the forum that we were able to know exactly where to head towards. From quite a distance, we could see the fish shop, or rather, row of fish shops, in an individual building just behind the Yishun Town Park. It was a shop consisting of three shops side by side. It is called Aquastar Trading, located at Block 934, Yishun Central 1. It was quite an eye-opener for us as besides the rather large variety of tropical fish, the shop was also selling quite a number of marine fishes. The latter are definitely very eye-catching, attributed to their bright colours and unique shapes. So far, the plants have been growing fine, with the ones at the side growing more rapidly. I’m planning to get another two sets so that I can fulfill my dream of accomplishing a ‘garden’ look; my previous attempts of carpet plants were all futile. After Golden had passed away last night, we quickly moved Leopard (who was quarantined with him since a day back) into another container to avoid contamination etc. We had him quarantined as his tail was starting to break away too, and he appeared weaker everyday. Hopefully the other guppies in the Main Planted Tank are not affected by this infection. We will monitor the situation. 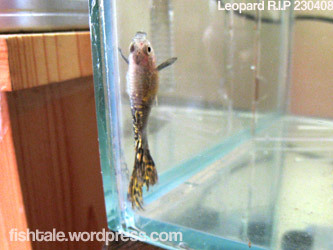 Our male guppy Golden started showing signs of reddish wounds at his tail (see Fin Rot or Fungus? ), and we had quarantined him since then. It was this morning that I decided to add a little of Melafix, a natural medication famous for curing tail and fin rot. I had purposely delayed the application of the medication only after three days that he was quarantined as I wouldn’t want to shock him with the change in water condition. Unfortunately, Golden still had to bid us goodbye, with half of his tail vanished completely. 13-Apr-07: Pretty arrived at our aquarium with few others, including Fei Fei, Hong Bao and Leopard. 10-May-07: Pretty gave birth for the very first time (see Our first Guppy Fries!) while quarantining her due to suspected internal parasite. 27-Jun-07: Pretty delivered for the third time (see More Fry Surprises!). 03-Nov-07: Pretty returned to the Main Planted Tank after being quarantined for a week due to a hole in her dorsal fin. A fight broke out between Fei Fei and her upon returning (see Fights between Pretty and Fei Fei). 12-Dec-07: Pretty living peacefully with her daughter, Pretty Jr (see Pregnant Mum & Daughter). 10-Apr-08: Pretty Jr died (see Death of Pretty Jr). 12-Apr-08: Pretty showing signs of aging with a croaked spine (see The Female Duo). 15-Apr-08: Pretty getting weaker (Pretty Getting Weaker). 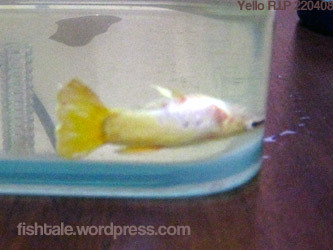 18-Apr-08: Her son Active showed filiality as her days were numbered (see Pretty’s Fillial Son). 19-Apr-08: Pretty said goodbye to all and left for paradise. We’ll miss you.